In the second segment of the show, Cade and Michelle discuss specific tech tools that you can use in your classroom in order to move students toward mastery of the ELA standards. Listened to the podcast but couldn’t take notes? Don’t have time to listen to the podcast but need some ideas to implement tomorrow? We’ve got you covered. 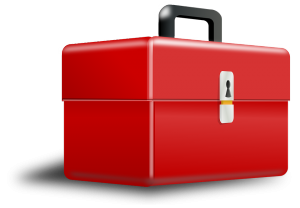 Seven of the nine tech tools we discuss on the episode can be found in our post below. If you aren’t using Google Classroom, stop everything right now and go create one. Google Classroom will streamline so much of what you are already doing, AND it has a rockin’ app that will allow you to post or grade assignments even if you go into panic mode in the middle of a little league soccer game on a Saturday. I’ll let you read all about it from Kasey at the links above, but just know that many of the online sources you use in your classroom will allow you to import your rosters from Google Classroom, making it so much simpler to set up your classes in a variety of sites, not just Classroom. A few sites that I love to use with Google Classroom that aren’t on Kasey’s list are CommonLit, ClassFlow, and StoryboardThat. Oh, and Classroom makes assigning things digitally so easy because you can make a copy for each student with one click. Collaboration is simple, too. Google Classroom, people. It’s a MUST. 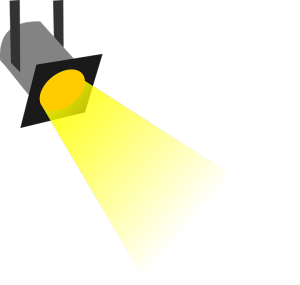 Learning Target: I can create an engaging multimedia presentation in collaboration with a group in order to present our ideas for our “How Might We…?” project to our classmates. Booksnaps can lead students to take ownership in their textual evidence. I often struggle to get students to select quality evidence to support their assertions. They tend to quote lines that are either short in length or the first thing they see. 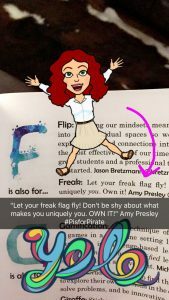 I have been known to say, “If you wouldn’t find it in a pretty font on Pinterest or Instagram, it’s not worthy.” Enter booksnaps. Booksnaps are a fun way to encourage students to choose better, more Internet-worthy quotes for their evidence. 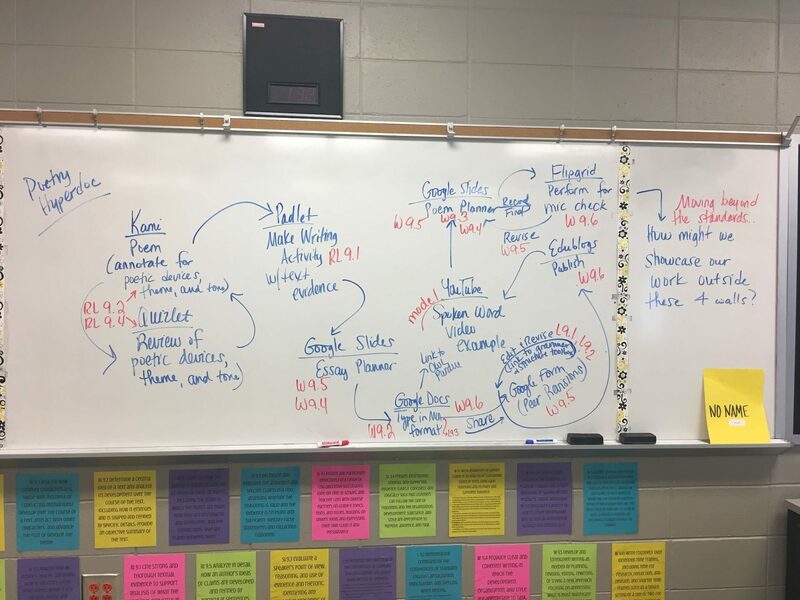 Learning Target: I can select textual evidence of figurative language in Act 5 scene 3 of The Tragedy of Romeo and Juliet and explain how Shakespeare uses figurative language to reveal something about the character of Romeo. Kasey talks about the power of publishing for a global audience. 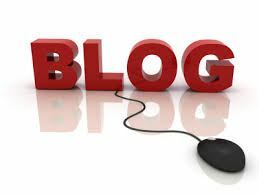 Having my students blog has been transformational in my classroom. 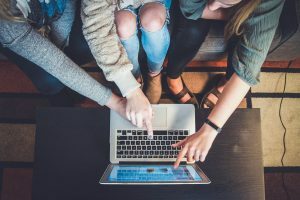 Blogging provides an authentic audience and a showcase for student writing, yes, but it does something even better: it gives students freedom to experiment with words and to find their own voice and style. Blogging did not come naturally to my students. They were used to being told how many sentences each paragraph had to be, what words they could or could not use, and what their introduction or conclusion needed to include. The first thing I told them was that they could relax and be themselves…as long as they still paid attention to how they were presenting themselves. In blogging, you get to decide how long your paragraphs are. It’s no longer about how many paragraphs are required but about writing enough to make what you’re saying worthy of your reader’s time. They also had no idea how to structure a blog post to make it visually appealing. This is where a Make Writing lesson came in handy and did the trick…and ended up being featured in Angela Stockman’s book, Hacking the Writing Workshop. By the way, I use Edublogs for my class. It’s easy to set up. You can check out my class site to see how I organize student blogs for easy access. Learning Target: I can write a personal narrative that utilizes precise words and phrases, telling details, and sensory language to convey a vivid picture of the experiences, events, setting, and/or people involved in my story. The two links above are the ones Kasey mentions in our interview, and there is very little I can add to her expertise. Google Slides is probably the most versatile tool I use in my own classroom. I love it! To be honest, the main reason I love it so much is that I can put my images anywhere I want to, unlike Google Docs. By the way, if you need some free images, try out Unsplash, Pixabay, or Pexels. If you’re feeling extra creative, you can make your own using Canva. Oh, how I love Canva. I have also found Slides to be very helpful with organizing my incredibly unorganized self. I keep everything I need for the week in a slide deck and add to it as I go: learning targets, bellringers, instructions, models, links, etc. Then when I need something, I know exactly where it is: all in one place in Google Slides. It’s been a lifesaver for this mess that I am, and I’m making slides for my class anyway, so I might as well keep it all together and tame the craziness, right? Did I mention you can save it as a PDF? That comes in SO handy. AND, as Kasey mentioned, you can change the slide size to whatever you need. AH-MAZING. Learning Target: I can create the same argument in five different formats (magazine cover, infographic, photo, poem, etc.) using Google Slides. “All we do is annotate,” said one of my most obviously engaged students at the end of this school year. Of course, that’s all my students do. They don’t read. They don’t write. No class discussions. No technology. No games. No laughter. Kami is a PDF annotation tool that syncs with Google Classroom and allows multiple collaborators through a Google account. To reiterate: Kami works great with Google! Although Kami works easily on most browsers, having the Kami Google Chrome extension allows users quicker access and gives them the option to use Kami as their default PDF viewer. Support for developing readers: For complex texts on the edge of students’ comfort zone, allow them to plug in some earbuds and use the text-to-speech tool to guide them through a text. Students can choose a voice they like, and they can choose to slow down or speed up the pace of the reading. Support for ELL students: Kami has a text-to-speech feature that uses Google Translate to translate texts from English to any language supported by Google Translate. For more on this, check out this Kami Blog post. This is not a ticket out of making other needed accommodations or modifications for these students. If students aren’t close to reading grade-level texts in English, then surely they’re going to struggle if your approach is to put it on Google to seamlessly translate a complex text into another language. Support for developing writers: Any length of writing requires stamina, but some students simply cannot put words into written work. Any ELA teacher can tell you about the students in the room who can’t write up to expected writing standards yet, but who can verbally articulate proof of their mastery of a host of other reading literature and informational texts, language, and speaking and listening standards. For that matter, they can even prove mastery in non-written writing standards, such as the components of the research and prewriting planning process. So use Kami with these students to get the most out of what they can do. Soft Skills: Many teachers have heard of the Talk to the Text reading strategy. This typically is an annotation activity and is similar to the Think Aloud strategy. A teacher could give students a complex text to read and require them to immediately record a Think Aloud just after reading. If the teacher has created a low-risk environment, students should feel comfortable with describing their thought processes about the reading, building their ability to express ideas clearly and instilling confidence in the importance of their ideas. Dramatic presentations: Teaching Shakespeare? Have students dramatically present lines (voice or video) to strengthen understanding of word meanings, language, pronunciation, expressiveness, emotion, style, and audience. This is engaging, but it becomes academic when literary analysis, language composition, and interpretative presentational elements become targeted learning components. I like doing this with humor devices and sound devices (e.g., alliteration, assonance, etc. ), both of which can be fun orally-presented literary devices. Fluency and accuracy: Elementary students and ELL students need to read before they can decode for meaning. Using the voice or video comment tools, students can record themselves reading a text for speed (i.e., words per minute) or accuracy (proper pronunciation of words). Thematic sound effects: In analyzing theme, have students identify plot elements, characterization, or diction that helps them identify themes in a text. They can then extend their understanding by selecting sound clips from Creative-Commons-Licensed websites such as FreeSound.org, SoundBible.com, or Free Music Archive that represent the theme. Students can follow up with a presentation of their sounds and have others guess the theme by the sound or music they selected, or they can allow collaborators into their document to guess there. Note: This requires recording sounds from the computer’s speakers, so students will need a quiet space for this. Presentational speaking: It might be another’s speech they’re analyzing, or it might be one they’ve written for some type of presentation. What students can never get enough of, though, is practice. Kami voice comments could be used to practice many verbal and nonverbal components of the speech: intonation, annunciation, volume, pausing, pace, emphasis, sounds, etc. Video comments could be used to practice remaining nonverbal components of a speech: posture, facial expressions, movement, appearance, etc. Research: Combine literary analysis with research. Students could do this for creating an argument based on a text or ideas represented through a text, or they could do this as a way of expanding understanding of a text’s social commentary. They can annotate the literary text for places which prompted research, then they could create video comments in which they formally present their findings and discuss the value the added exploration on their understanding of the primary text. Seeking help: Throughout the process of writing students could be required to leave questions or comments for peer collaborators or the teacher. Questions such as “How could I better incorporate the prompt into my thesis?” or “Am I using enough variation in my sentence structure?” could be asked in voice or video comments, allowing those seeking to offer suggestions an impression of the writer’s thought processes, sincerity about the topic, and understanding of their purpose and content knowledge. Teacher feedback and student revisions: The teacher can type comments or record voice or video comments for students in Kami. A lot of teachers love this because it allows them to record comments quicker and more candidly. This is important for any of the uses already mentioned. Feedback makes a huge impact on students’ learning while using Kami. And side note: There are cool Kami features for math and science folks, too. Check those out in this post. Learning Targets: Example 1: I can identify and provide evidence of two themes in Acts I and II of The Tragedy of Julius Caesar. Example 2: I can read a grade-level text pronouncing words with 95% accuracy. Example 3: I can identify areas of weakness in my writing and determine specific practices to make them stronger. How on earth do you use a green screen in an English classroom? Just like any other trendy tool the hippest administrators squeeze into their school’s technology budget, green screens can be used as nothing more than that: a trend. But with a little thought and planning, green screens can be used to teach students standards in a way that they will grasp more easily than any traditional method. 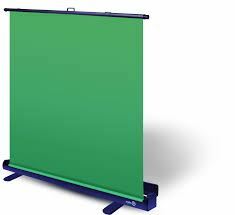 Green screens can also be a tool students can use in presentations to make them more realistic and to create a setting for their narratives, monologues, poetry readings, etc. Produce clear and coherent writing in which the development, organization, and style are appropriate to task, purpose, and audience. [W 9.4] (This would be an introduction activity to help students understand just how important audience and purpose are. The teacher would get a student to give a short speech in front of a green screen. Then the teacher would show the class the speech with different audiences–panel of politicians, class of kindergarteners, group of veterans, etc.–and then have the students analyze how the speech would need to be changed in order to fit the different audiences. Then students would write their own speech, first determining their audience and purpose. Learning Target: I can explain how effectiveness of a speech changes with its audience and purpose. TOOL #7: Eh, What’s Up HyperDoc? Any good lesson in the ELA classroom includes at least some of the 4 Cs (Critical Thinking, Communication, Collaboration, Creativity). Hyperdocs can help you get your students through all four of the Cs of learning in one lesson or unit and, if done well, can create a space for the dynamic learning Kasey encourages. The thing about hyperdocs is that they are not just clickable documents. Adding a few hyperlinks does not a hyperdoc make. A true hyperdoc is a well-crafted lesson or unit that focuses on standards and may include choice, assessment, reflection, creation, and even collaboration. 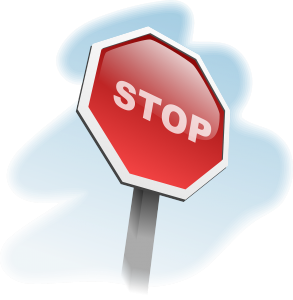 I’m going to be real with you–you can’t throw a hyperdoc together quickly. A great deal of planning and preparation must go into a quality hyperdoc that will lead to the level of learning you want. Check out the Hyperdoc Girls’ website to learn all about the pedagogy behind this amazing use of tech in the classroom. With all of that said, you’re going to want to get your feet wet by starting small. The AMAZING hyperdoc that Kasey features on her website is NINETY-SEVEN slides. That is impressive! But hear me now: Do not be intimidated. Not all hyperdocs are that lengthy. If you create a hyperdoc that is SEVEN slides, you can pat yourself on the back. Just get started. As with most new strategies we try in the classroom, the first one probably won’t go as planned. Links may not work. Students may have a ton of questions that make you doubt yourself. The learning you hoped for may not, indeed, occur. And that’s okay. Let’s start by creating a simple hyperdoc for a common lesson: poetry. But before we even start creating the lesson, we have to decide what we want the students to LEARN from it. And, finally, I like to push my students beyond the boundaries of the standards and into the real world by having them answer a “How might we…?” using the design thinking process. So I’ll include that as well. Once I know what I want my students to LEARN from the unit, I’m ready to start planning the hyperdoc. I start by mapping it out. I’m including a picture of my crazy thought process below. Don’t let the mind of a crazy person make you feel overwhelmed. Step 1: Put the poem on Kami so the students can annotate digitally. Step 2: Create a Quizlet of poetic devices, theme, tone, etc. as a quick review. Step 3: Create a Padlet board for students to add textual evidence from the poem. Step 4: Create an essay planner as a table in Google Slides. Step 5: Create a Google Form for revisions. Step 6: Find a video of a spoken word poem that is appropriate and engaging for my students. My favorite is “Teeth” by Phil Kaye. Step 7: Create a topic on Flipgrid. Step 8: Make sure all of my students are set up on Edublogs if I haven’t already done so. Step 9: Get my link ready for Owl Purdue MLA format guide. Step 10: Make sure all of my resources for grammar and sentence structure are in my Google Drive and ready to be linked to my Google Slide. Step 11: Make sure my rubric and checklist for revision are in order. Does everything I’m having the students do connect to the overall learning I want for them? What will my learning target(s) be for each step of the hyperdoc? Will my path for the students make sense to them? Is the learning dynamic or static? Are the tasks sufficient for making sure the students have the opportunity to master the standards? Have I provided enough structure and modeling for the students? How many of the 4 Cs have I incorporated? Am I clear about how I will assess the learning? Am I clear about how the students will self-assess? Is the rigor where I want it to be to push my students beyond their current comfort zone? Have I provided supports for my struggling students? After this reflection, I realize I have not offered choice. Instead of directing students solely to create a spoken word poem, I will allow them to choose the type of poetry they create and how they will showcase their work. Now that I have worked out all the details and I’m sure of what I want my students to accomplish, I’m ready to begin creating my hyperdoc in Google Slides. When I’m done creating it, I’ll save it as a PDF and assign it in Google Classroom. 🙂 Now I am freed up to help students individually as they progress through the tasks and give them the one-on-one attention they need from me. 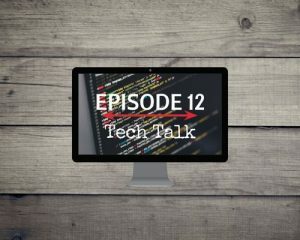 Listen to “ATH E12: Tech Talk” on Spreaker.